Have you been missing all those custom details? Longing for golf course living – and all the amenities that come along with it? Start checking off all your wants here! At 312 Waterville Street in Raleigh’s Eagle Ridge community, Hillman Real Estate Group is pleased to present this four bedroom home for sale. Nestled on the sixth tee and featuring views of the seventh fairway, not a detail has been overlooked! 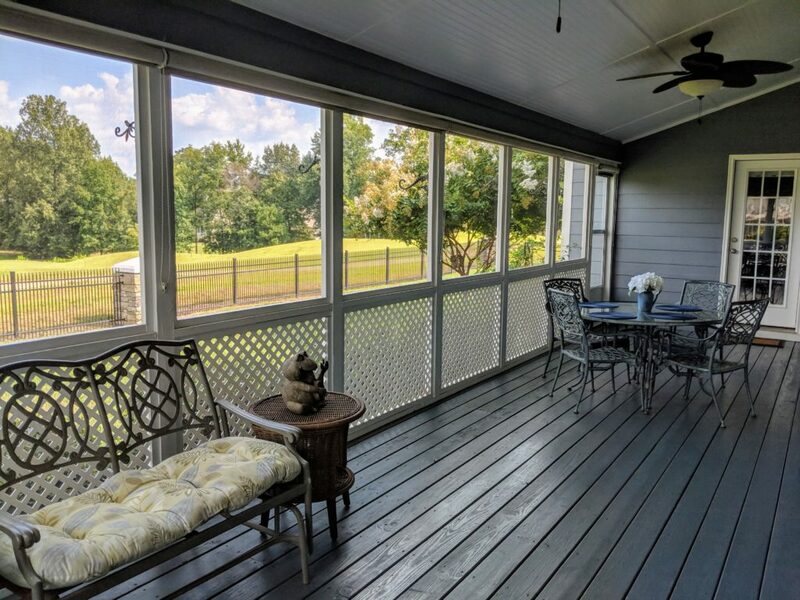 A Juliette balcony overlooks the soaring family room and a screened porch allows you to enjoy the view and custom fencing surrounding the level backyard. Inside, enjoy dinners with family and friends alike in the gourmet white kitchen. There’s ample room for relaxing and recharging in the main floor master suite, complete with study, while a huge bonus room and three additional bathrooms upstairs offer lots of room for family and guests. Two full bathrooms also upstairs mean easy morning routines, too! “We have loved living in this home and know you will, too! The arched stone entry over the front door. The size and layout of the home, which surprised us when we first viewed. The kitchen has held many gatherings, the breakfast nook with the wall of windows offers fabulous views of the yard & golf course. It also holds our table for eight quite nicely! The island is convenient and can seat four for a casual quick bite. With more than ample cabinets, a spacious French door pantry – there’s really room for everything! The way the stairway is situated so it is not in front of the front door (and is a great place to put the Christmas stockings) is a favorite along with the catwalk & the metal railings. The space over the fireplace has worked well for our scenes at Christmas. The “Bridge” upstairs, which can hold a table and sofa for reading, etc. The wood built-ins in the bathrooms and bedroom closets. The Jack & Jill bath with the guest bedrooms. The coat closet. The storage space in the floored attic and behind the large upstairs closet has been a lifesaver… and as the icing on the cake, we’ve absolutely loved our neighbors, too! We’re excited for you to see our home and fall in love like we did! Outside, the neatly landscaped yard is ready for you to enjoy and a built-in sprinkler system will keep it looking fresh with ease. $15,000 worth of plantation shutters and shades add serious curb appeal. If you can pull yourself away from this wonderful home long enough to enjoy a round of golf, an afternoon at the pool, or lunch at the clubhouse, you’ll find this amenity-rich community offers much to be desired but the rates for membership and use are still very affordable compared to other regional offerings. HOA dues are just $250, twice a year, and golf tee times begin at just $30 at GolfNow.com. Plan on playing often? Golf memberships start at just $89 per month and include access to other local courses including Riverwood, LionsGate, Mingo Creek, Tralee, Hedingham, and Olde Liberty. Downtown Raleigh is less than 20 minutes away – making for an easy work commute or prime opportunity to enjoy all the restaurants, nightlife, live music, and weekend activities your heart desires. Ready to view this home in person? We can’t wait to show you around! Please contact Renee@HREGSells.com or 919-868-4383 to schedule your showing.